This week’s challenge seems a bit contradictory. Anyone who has read my posts will know I have many places in nature where I enjoy quiet, wide open spaces. But a happy place, for me, is where friends get together, it’s usually crowded, and the music is bordering on being a bit loud. Sometimes rowdy with people pushing in can = happy. Here in Las Vegas there are many talented people, but you won’t find a lot of young upcoming acts hoping to be discovered. The casinos tend to dominate the entertainment here, and for some, being booked as a regular act in a lounge can be lucrative. 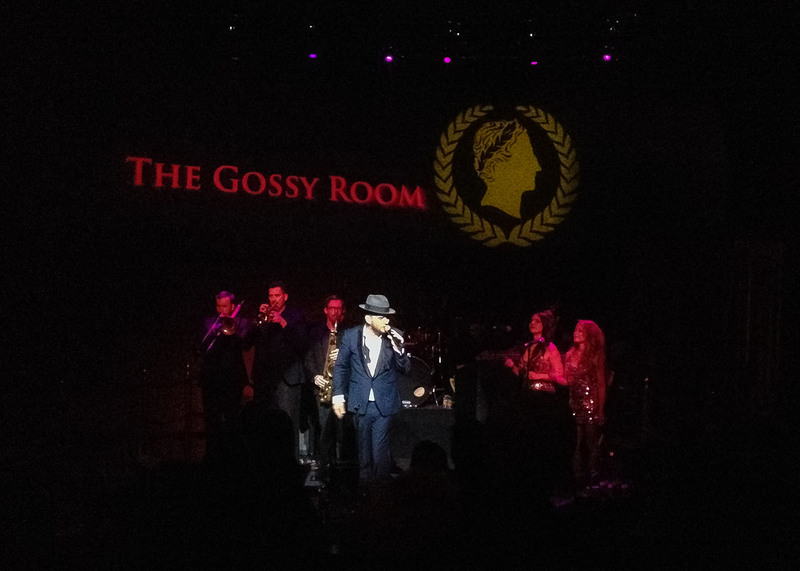 Matt Goss in one of his performances at Caesar’s Palace, Las Vegas. One such lounge, the Piazza Lounge at the smaller, independent Tuscany Casino has been a happy place for some locals. The entire bar, seating area, dance floor, and stage combined is about the size of an apartment – a dive by most standards. The energy level on many nights has made up for whatever the place lacked in size and class. Through the years, they have had a few acts performing on a 4-5 night a week basis. Several years ago, a band named Cool Change was there. The band consisted of two men, Joe Esposito and Randy Hall. They played guitar and keyboards to a drum soundtrack while sharing vocal duties. At first glance, this band is what you would have expected in a place like this. Joe and Randy, however, had been long-time studio musicians, appearing on hundreds of songs in their careers. Both are grammy nominated and have many connections in the industry. After a couple year run, and much to our initial disappointment, the Piazza Lounge replaced them with the Corro Van Such Band (pictured on top). It didn’t take log to realize that band members Enrique Corro, David Van Such, and Derrick Cordero were quite talented as well. Even though Derrick played percussion, they also played along to a drum soundtrack. More recently, the lounge has replaced them, and has gone to a line-up of different bands for different nights of the week. Although these bands played with only a small variation in their playlists, you never knew who was going to show up to join them. This was especially true with Cool Change. During one week, the legendary Spinners were performing at a casino a few miles away. A couple days prior, their lead singer was in the crowd. It was a genuine treat to hear this man’s voice, sweeter and richer with age, as they performed one of the Spinners biggest hits – live and better than the original recording in a room with about thirty people. One special happy moment among many. Who would have thought a cheesy lounge in a small casino could be a happy place? I agree. I have lots of places I have been to and been happy to be there but my happy place, the place where I am happy in my heart and soul is anywhere where I am surrounded by family and friends. If the challenge had been Get Away, I might have posted an image or two from a serene location. Happy Place just made me think of family and friends, but I’m trying to keep those out of the blog. I know Enrique, David, and Derrick don’t mind a little publicity, and I thought the shot of Enrique smiling while he’s playing the guitar really summed it up.